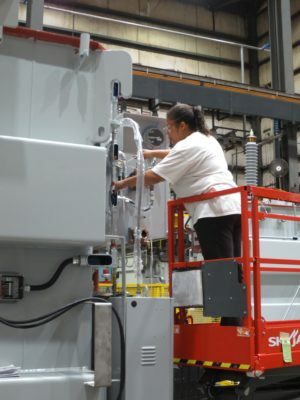 Final Transformer Assembly | SPX Transformer Solutions, Inc. Final Assembly begins with the removal of the core and coil assembly from vapor phase. All internal assemblies are re-pressed to an engineering-specified pressure to ensure tightness now that excess moisture has been removed. Metal and fiber nuts are tightened or torqued as required and electrical clearances verified again. Core and coil assembly is placed inside its tank, tank is filled with oil to stop exposure to air, a cover assembly added and bushing connections made. Once the cover is welded and leak checked, galvanized radiators are assembled to the tank, the unit is drained and the transformer is vacuum filled for final testing. During this same time, the control box and any other customer-specified monitors and components are installed and wired. All external welded assemblies are mounted to ensure correct fit to the tank and removed before the finished transformer moves on for factory acceptance testing. Fully galvanized, hot-dipped, corrosion-resistant radiators come standard on all Waukesha® transformers. Designed to simplify maintenance, reduce field service time and enhance field changes.